and Mark Mon-Williams for Rombald's Stride. Other nominations were all related to the fell race and included marshals, sweepers and junior fell race organizers. The committee would like to thank everyone who has helped to make this race such a success. From Steve Weston, race organiser, ...Another fantastic Ilkley Moor Fell Race, slightly wild conditions but then isn't it always! Good runs from the Ilkley Harriers bringing home 1st & 3rd overall, 2nd lady, 1st F50, and 1st M70, and ladies' team prizes. Thankyou all to all the marshalls and officials that made it happen. race page with archive results, etc. From Jack Wood ... Lovely blue skied morning for the final PECO cross country at Roundhay Park. 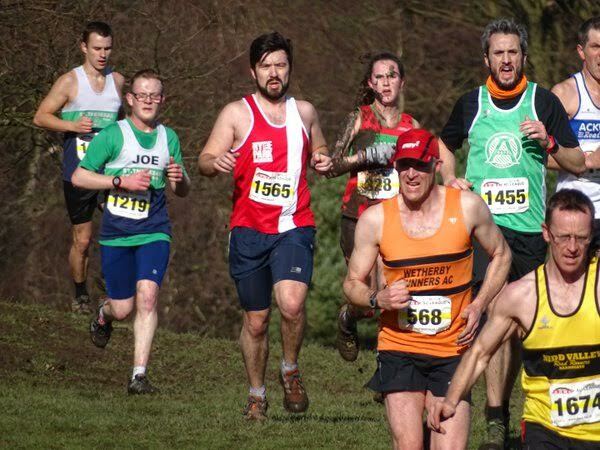 In the men's race I had a good run coming 2nd, Steve Coy also ran well to come 5th M40 (42nd overall), Richard Joel was 12th M45 (103rd), Mark Illey 9th M50 (111th), Robert Budding 18th M45 (174th), Andrew Jackson was still recovering from Thursday night's Jack vs Jacko and was 34th M50 (240th) and Don Mcrae was 2nd M70 (328th). 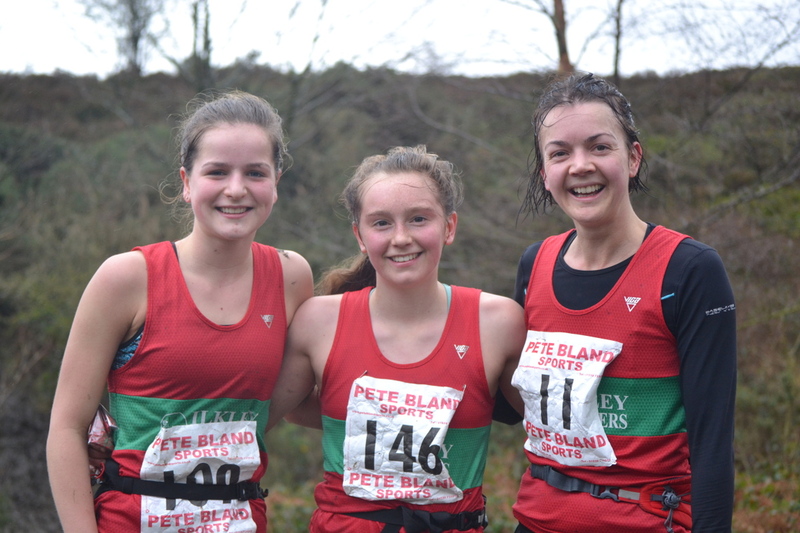 In the women's race Lucy Williamson survived a fall to finish 17th, Mary Gibbons made a strong XC come back in 30th, Alison Eagle was 3rd F50 (46th) and Gaenor Coy 19th F40 (109th). Club Treasurer Martin Archer has set up an account with 'Easyfundraising' so that you can help raise funds for the proposed new athletics facilities when you shop online. This won't cost you anything, you just have to register and follow the simple instructions for shopping with a huge range of online retailers. There's more information on the junior website. From Petra Bijsterveld ... No one enters the Dewsbury 10K with its 9 am start for the scenery or for a pleasurable experience. An out and back course along a straight road through an indifferent urban landscape, this course offers excellent PB potential. With a slight rise on the 3 miles out, the return should in principal make a negative split easy to achieve. Today however the wind had other plans and we battled against a head wind on the way home, though none of us seemed to have noticed any benefit from the wind on the way out. 3 men and 3 women Harriers ran, and superb support was offered by Helen Waddington who rested her legs but did the driving and jumper-holding, as well as offering great moral support. All ran very well, with Matt Newell and Adrian Bastow both improving on their previous Dewsbury times. Unfortunately I was suffering with stomach pains and had an underwhelming run today, which was disappointing after my PB there last year. I was over 3 minutes slower and seemed to almost come to a standstill in mile 6, being overtaken by a lot of runners which was morale-sapping. I shall just have to try again in 2017! From Ben Sheppard... A boggy and rainy edition saw Jack Wood give Graham Pearce a run for his money, with Jack arriving at the school gates marginally ahead after a sprint finish down the road into Guiseley. Unfortunately for Jack, it's whoever enters the building and reports to the desk first who goes down as the first one home in this long distance walking association event. He didn't seem bothered as he tucked into his school dinner in the hall afterwards. A good turn out of Harriers in challenging conditions. From Jack Wood ... A wet and boggy day of learning from the Rombalds Master and ex Ilkley Harrier Graham Pearce. We ran together with Joe Baxter over the moors and up a muddy Chevin before I pushed on towards Guiseley. Despite getting on with these guys, they are P&B and I wasn't going to finish hand in hand with them if I could help it. As I reached St. Oswalds School with Graham just behind I looked for the finish but in my hesitation Graham went through a door and gave his number for the win! A cheeky but probably deserved victory having led us along fast lines for most of the course. A number of harriers both running/walking and supporting, special mentions to DanW taking pictures on the moor and NeilC who I saw on 3 separate occasions. Thanks DuncanC who kindly gave me his entry after being injured. Results ... and PDF copy. From Petra Bijsterveld ... Tom Adams set a new course record for the Cleethorpe parkrun course.